Flowers with glitter-powder and nail lacquer – Summer party nail art motif. 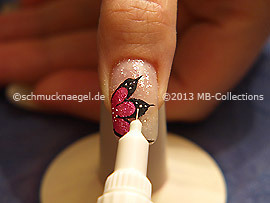 Paint the fingernail with the clear nail lacquer. Begin at the rear side of the fingernail and pull the brush forward to the edge of the fingernail. 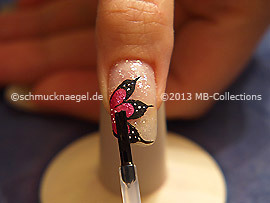 Draw with the nail art liner in the colour fuchsia a similar design on the fingernail. 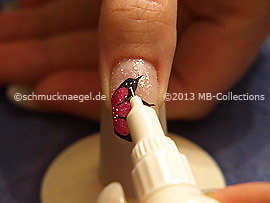 Now fill out the inner surface of the sample with the nail art liner (see on the left side). Draw with the nail art liner in the colour black a similar design on the nail lacquer in fuchsia. 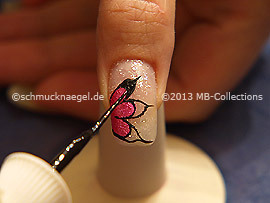 Now extend the petals with the nail art liner in black (see on the left side). Fill out the tips with nail art liner. The motif ‘Flowers with glitter-powder and nail lacquer’ should correspond approximately to the picture. 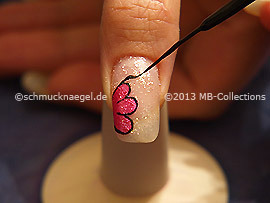 Before you continue with step 4, wait until the nail lacquer on the fingernail is dried. 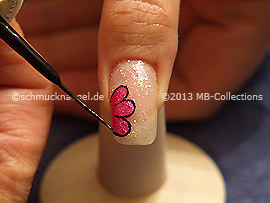 Now draw with the nail art pen in the colour white several small points on the flower motif. The nail art motif ‘Flowers with glitter-powder and nail lacquer’ should correspond approximately to the picture. 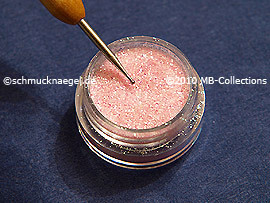 After the clear nail lacquer is dried, the nail art motif ‘Flowers with glitter-powder and nail lacquer’ is finished. Flowers with glitter-powder and nail lacquer was last modified: November 22nd, 2016 by Make it Smart e.K. Glitter-Powder, Nail art liner, Nail art pen, Spot-Swirl.